These days, any mention of a ‘scrambler’ usually sparks a fervent debate about what exactly the name means. 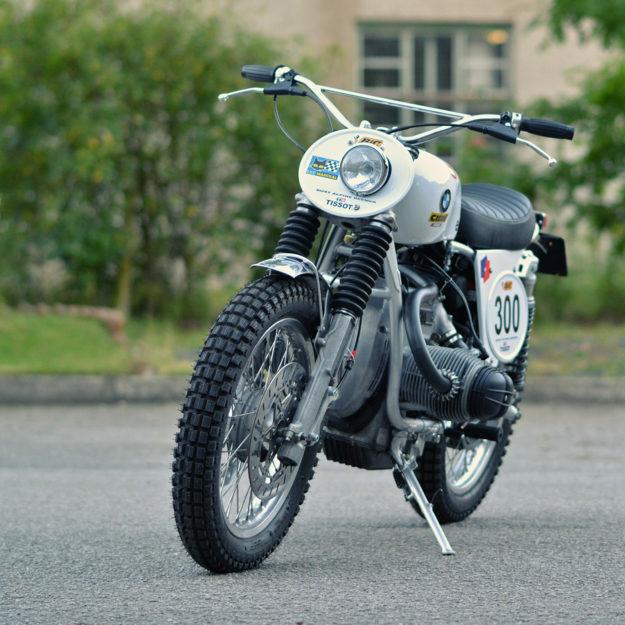 But here’s something we can all agree on: vintage-style scramblers are seriously cool. 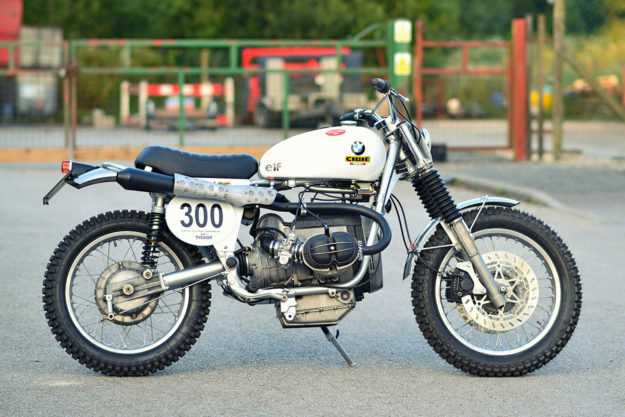 We’re talking about those machines that actually went off-piste; duking it out at the legendary International Six Days Trial, or blazing a trail across the Californian desert. Back then they were all about function—but today they’re just as much about nostalgic appeal. 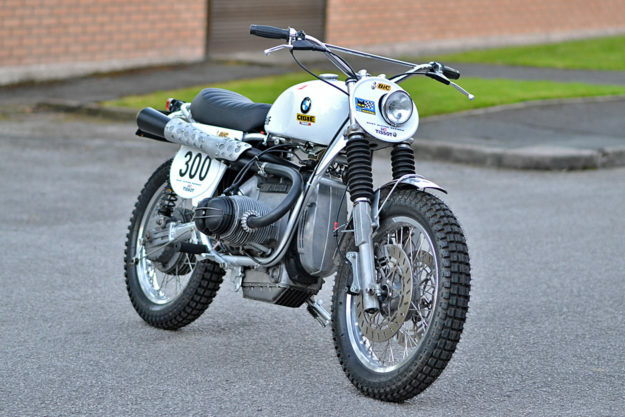 Stephen Bentley of Dust Custom Motorcycles has captured the scrambler vibe perfectly with this latest build. And even though he’s used a BMW—rather than a British or Swedish donor—it wouldn’t look out of place next to a waxed cotton jacket, an open face helmet and some Barrufaldi goggles. 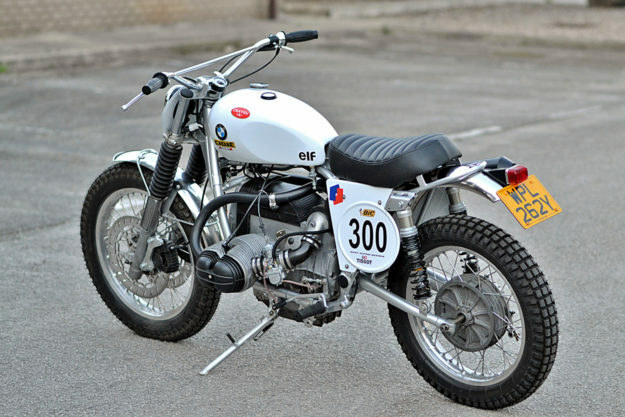 The donor bike is a 1982 BMW R100 RS. 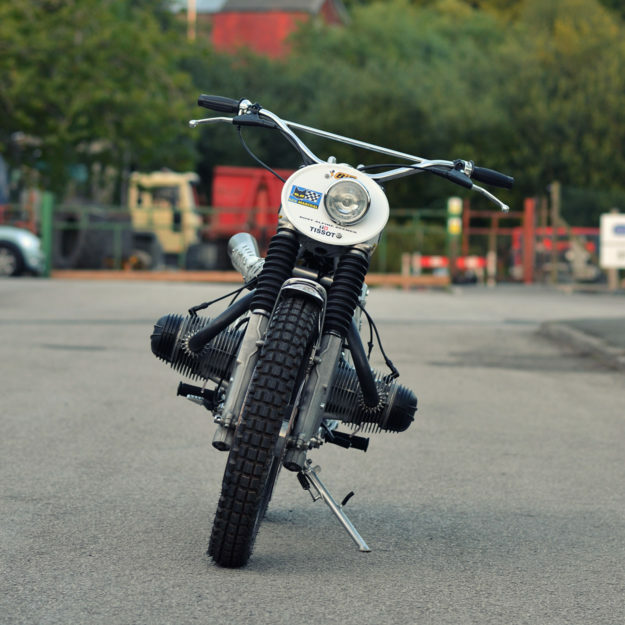 After some deliberation, Klaus and Steve decided to leave the engine stock: “In reality, it has more than enough razz for a road-biased scrambler on square blocks,” quips Steve. He did put the old boxer through a top end, gearbox and bearing overhaul, though. And then installed a pair of Mikuni VM34 carbs. Those he hooked up to a single K&N filter, cutting up the original airbox cover to hold everything in place. 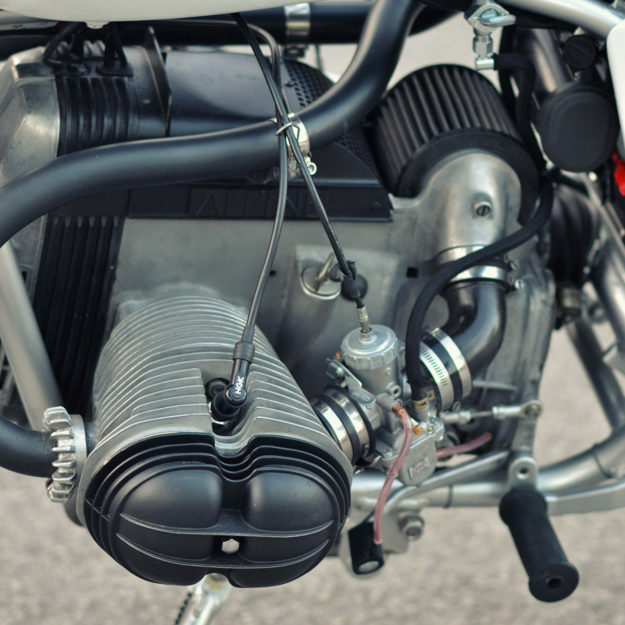 The high-riding exhaust system is from the British vintage specialist Raysons, and has the tiniest amount of baffling in it. “I got two other commissions for scramblers at the same time,” says Steve. “After seeing Ben Hardman’s work at Raysons, I sent a bike over and got a few pipes made.” The whole system’s been ceramic-coated black, and capped off with a hand-made heat shield from Steve’s bench. First up were the brakes. 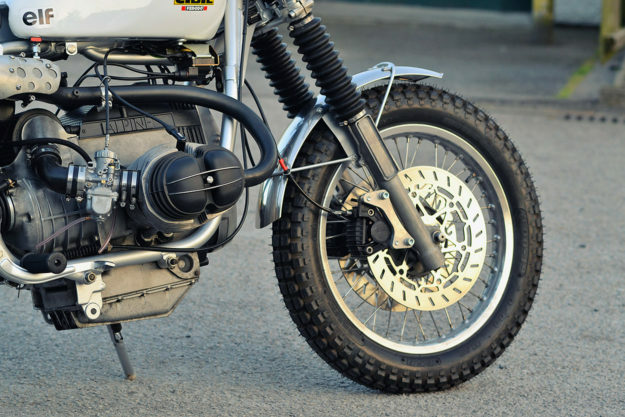 Steve swapped out the BMW’s ‘snowflake’ wheels for a set of ex-Police spoked numbers, and installed a pair of aftermarket BMW GS ‘single disc’ kits. Since each kit was designed for one side, Steve had to CNC the opposing caliper bracket. The master cylinder is hiding under the tank—leaving the cockpit slim and appropriately vintage. The forks are still original, but feature new stanchions and internals. The rear’s propped up with a pair of Öhlins shocks, specc’d at 10mm longer than stock. 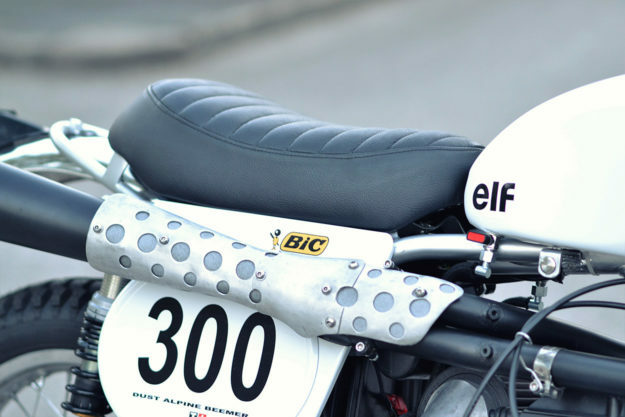 Steve stuck to the same formula as his previous airhead scrambler for the bodywork: a 1970s Triumph T140 export tank, with hand-made alloy number boards. The fenders are trials-style stainless steel units, trimmed and mounted on custom-made brackets. He also modified the subframe with the same adjustable angle rear loop as before. 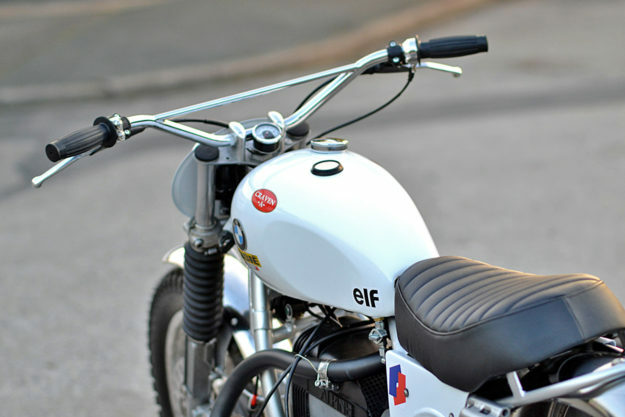 Sitting up top is an aftermarket BSA Gold Star scrambler seat, modified and re-upholstered in leather. Superfluous attachments—like the original pillion peg hangers—have all been trashed. There are a couple of clever little mods hiding in plain sight elsewhere. Steve adapted the side stand from a Suzuki DR650 for more secure parking. And he ditched the R100’s awkward brake lever (designed to fit around the OEM exhaust) for a neater one from a later model GS. The cockpit is as old school as it gets, with modified Yamaha XT500 handlebars, Magura levers, a BSA alloy throttle, and Beston grips. A tiny speedo and push buttons from Motogadget complete the package. (With no turn signals to operate, the setup totals just three buttons). The front number board-with-small headlight arrangement is just one of four configurations that Steve designed. 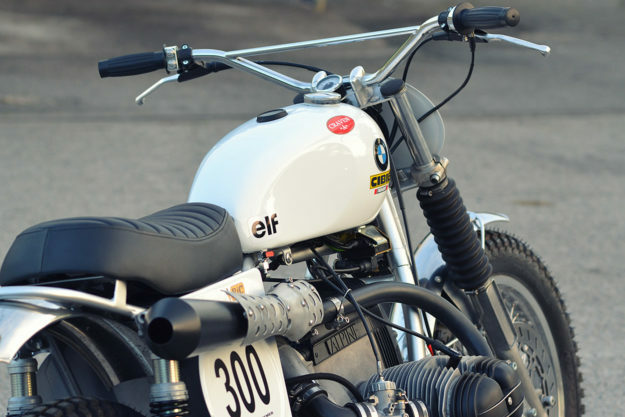 He’s set it up that Klaus can swap it for just a number board, a larger 6” headlight with a stone guard, or nothing. That last option shows off a beautiful Dust badge on the steering neck, and there’s even a S.E.V. Marchal rally-style cover for the bigger headlight. With the direction the build took, BMW’s Alpine White was the only logical color choice. Steve turned to David Wright to execute it, finishing it off with a few ‘sponsor’ decals for a classic competition feel. After a “rather jolly road testing period,” the bike was crated up and sent to its new home in Toronto. 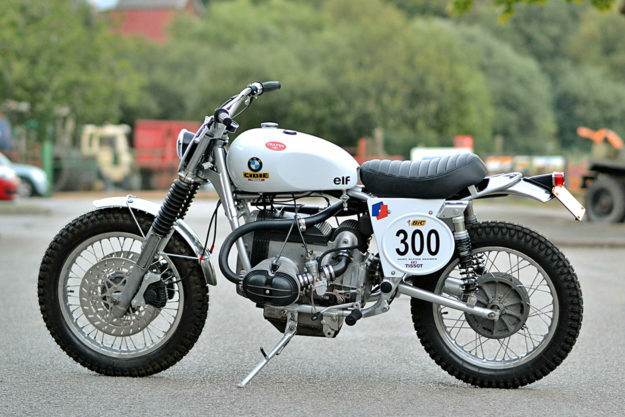 The Alpine Beemer is a cracking example of one of our favorite styles. It’d probably be just as much fun hooning around town as flying down fire roads. 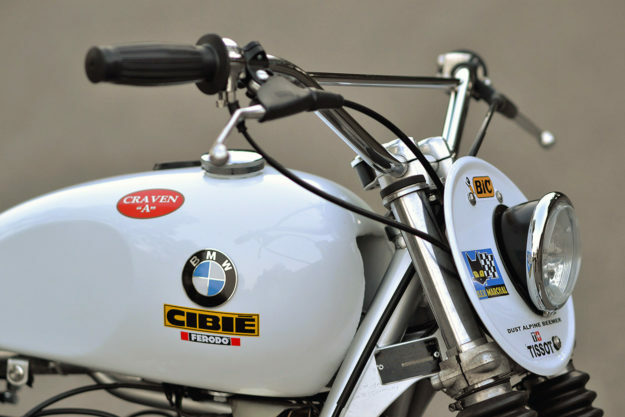 But more than that, it has us pining for the days when you could still put ‘Craven “A”’ on the side of a race bike.